Many stars give off radio waves along with light on various spectrum. 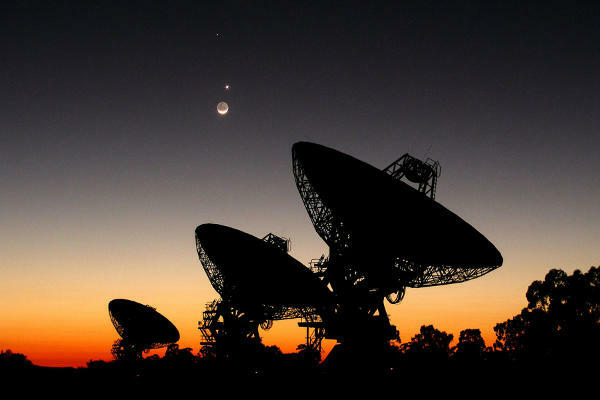 Astronomers are able to use large radio receiving dishes to collect and study these radio waves that are being sent out by the stars. Most people associate magnifying lenses and mirrors with telescopes but in the radio telescopes, the saucer shaped radio reflectors are the equivalent of the “mirrors”. Australian Radio Telescope Array in rural New South Wales. Mercury, Venus, and the Moon happened to be aligned above the array. Radio telescopes allowed us to tune into distant stars, galaxies and celestial bodies that do not give off any visible light to be seen by optical telescopes. Radio telescopes also allow astronomers to “see through” other obstructions like clouds, cosmic dust and various gases found in space. The world’s largest single-aperture radio telescope is found at the SRI International operated Arecibo Observatory in Puerto Rico, and its bowl is 1,000 feet across. The Arecibo Observatory sustained some damage during a 6.4 magnitude earthquake on January 13, 2014 which required emergency repairs.